The Turkish property market is thriving thanks to the record number of foreign buyers who are purchasing apartments and villas all over the country. While a slowdown and higher interest rates have affected domestic sales, overseas sales are clocking up record numbers in regions around Turkey. It is a multi-cultural affair as well because property buyers include Middle-eastern, Asians, and European nationalities. Without a doubt, Turkey’s real estate market is enjoying international fame and popularity. However, what’s the reason for this sudden popularity? There are quite a few. Is Turkish Property a Good Investment? Many short-term and long-term factors appeal to investors looking for a long-term financial commitment. In 2018, difficulties in Turkey’s economy caused a recession and the exchange rate to drop, and in the process gave buyers more value for their money. Rates averaging around 5.30 Turkish lira to the dollar have peaked investors' interest as they see an opportunity not to be missed. In many areas, an abundance of the off plan and new build homes are also keeping property prices down but providing hope for long-term capital appreciation. The other big factor attracting foreign home buyers was in 2018 when Turkey lowered the required amount for their real estate citizenship investment scheme. Many countries around the world offer residency and citizenship privileges for international property investors. However, before 2018, Turkey’s minimum requirement was 1 million USD putting it off the radar for many. In 2018, they dropped the amount by a staggering three quarters to 250,000 USD and this brought in a flurry of people who want to buy a house, live and work in Turkey. So, where are investors and buyers who want a second holiday home flocking to? Which areas are proving more popular than others and for what reasons? Turkey has seven regions: the Aegean, Mediterranean, Black Sea, Marmara, central Anatolian, eastern Anatolian, and south-eastern Anatolian. Records show that overseas home buyers rarely purchase property in the South-eastern, central and east Anatolian regions. As landlocked areas, foreigners who want to buy a property generally gravitate towards coastal destinations instead. Those areas are also culturally different and the housing market is far behind in terms of architecture, modern and new builds. Instead three regions, in particular, stand out as the most popular. 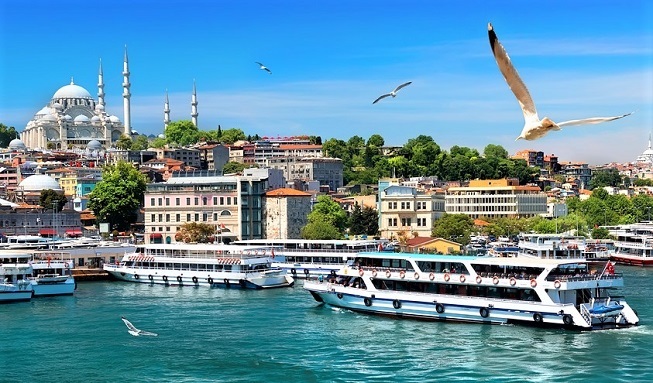 Marmara: Rocking in at first place, the Marmara region is a significant player in its camp, namely Turkey’s most prominent and busiest city: Istanbul. As the centre of tourism, education, business, trade, economy, and health, investors are easily attracted. Over the last ten years, Istanbul’s housing market has also expanded into outskirt districts, with new skyscraper community projects dominating the off-plan market. Prices of these homes are lower than the city centre and include many features of residential property like swimming pools and landscaped gardens. Middle-Eastern buyers, in particular, have also turned towards the Bursa and Yalova provinces for their real estate investments. The former Ottoman capital of Bursa has a strong feature in its cap as home to Uludag, one of Turkey’s most prominent ski destinations, while the green plateaux and natural hot springs of Yalova offer a more laid-back atmosphere. Mediterranean: As the second most popular region for foreign house buyers, the Mediterranean coastline includes a splattering of towns, villages and cities that appeal to overseas buyers of many nationalities. 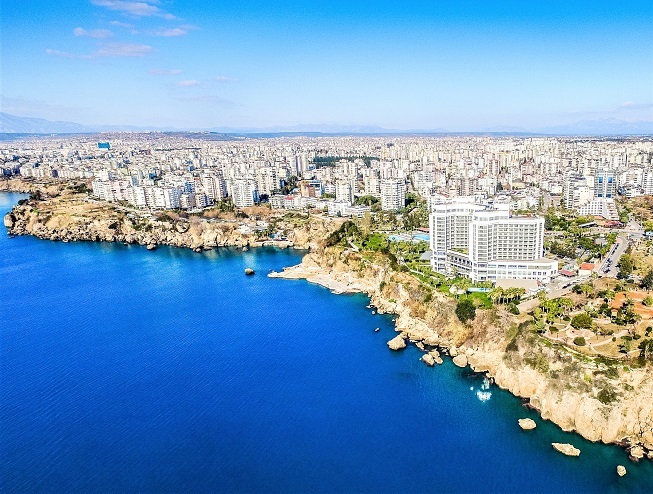 The Antalya district garners fame as the most popular thanks to its large city centre and smaller coastal resorts like Belek that is Turkey’s golfing capital. The Fethiye area seems to have won favour with Brits and as well as being a popular holiday destination for them, is now home to large pockets of British expats who live in Turkey all year round. They like the smaller coastal resorts of Hisaronu, Ovacik and Calis beach. Kalkan, a small upmarket town makes a roaring trade for luxurious villas with the latest in architecture trends and amazing sea-views, while Marmaris is popular with apartment buyers. 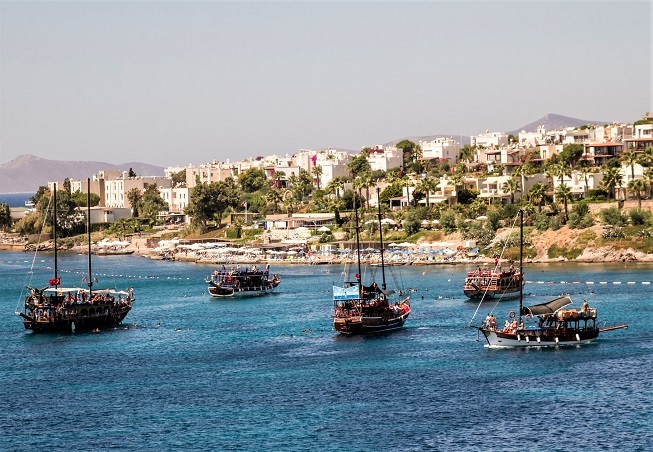 Aegean: Heading around to Turkey’s western coast, the Aegean is another favourite destination for European buyers with many purchasing holiday apartments and villas on the Bodrum peninsula. It’s easy to understand its appeal since, for decades, its hedonistic reputation has attracted carefree spirits from all over Turkey and the world. Bodrum town centre offers upmarket homes for sale, but in recent years, its popularity as a luxury destination slipped to second place as Yalikavak overtook as the place to be seen and heard. Other favourite destinations in Bodrum include Gumbet, Golturkbuku, Torba, Bitez, Gumusluk and Gundogan. Brits also dominate the house buying scene in Altinkum, a small Aegean coastal resort offering low prices per square meter. Otherwise, as people look to distance themselves from Istanbul, Izmir’s popularity is growing. The area includes Turkey’s third largest city but also smaller coastal resorts like windsurfing Alacati, and quaint Foca. 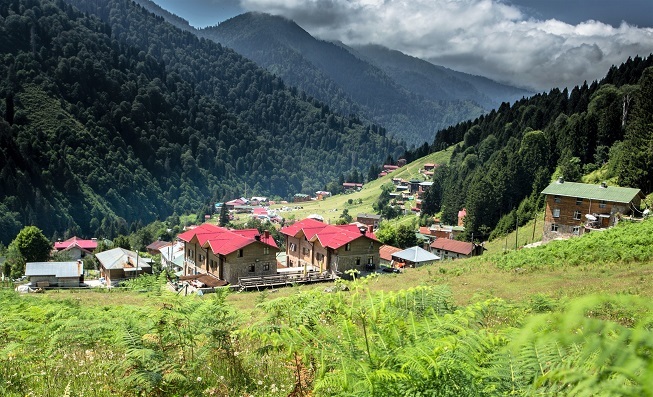 The Marmara, Mediterranean and Aegean regions used to dominate the foreign property scene, but Middle-eastern buyers who find many similarities in culture have flocked to the Trabzon province. Sitting in the Northern Eastern Black Sea region, this conservative city also offers easy access to plateau regions and attractions like Ayder Plateau and Uzungol lake. It's fast transforming from a bland destination to one that counts itself as a favourite place to visit in Turkey. So, will Turkey’s real estate market continue to garner fame with foreigners? It appears so. Financial and sector experts indicate the current lucrative exchange rate shows no sign of lessening and this is one big factor driving Turkey’s popularity. In January 2019, house sales to foreigners were up a staggering 81%, and that trend looks set to continue. Also, the citizenship program is still pulling in buyers from the UAE, where applications are up a staggering 55%. It seems the investment opportunities are too much to ignore. If you are looking at the Turkish property market but would like to know more about regions and investment opportunities, call or email us. As an established real estate agent operating in significant areas, our experience and knowledge of the market have proven valuable to foreign buyers looking to make a sound investment and, sometimes, live and work in Turkey all year round. Alternatively, see our extensive portfolio of apartments and villas for sale in Turkey or contact us to arrange a property viewing.